It is no secret that many jobs require workers to perform in hazardous conditions. According to the Bureau of Labor Statistics), 4,628 workers died in 2012 while at work, which is the equivalent of 12 deaths every day, and the number of injuries is even more staggering. Among work-related fatalities in construction, the leading cause is falls, and this statistic extends into several other industries where workers perform duties above the ground or floor or a building. If it sounds like we’re feeding you doomsday information, don’t worry – there’s good news! Following the right safety procedures, particularly via use of equipment like retractable web lanyards, will keep you and others safe as you maneuver around your work site. Here’s a brief review of the web retractable lanyard, one of our most popular pieces of fall safety equipment. First, some background: several different fall protection systems are available that allow companies and contractors to comply with federal and state OSHA safety regulations, and each system is categorized into a separate class or group. Fall arrest systems are the most popular because they allow workers to experience the greatest freedom of movement. These systems keep workers from hitting the ground should they fall from distances of 6 feet or higher and usually consist of a body harness that is attached to an anchor by a lanyard. However, injuries can occur when people fall from distances of less than 6 feet, and specialized safety equipment has been designed to protect people from such occurrences. One of the most popular systems for short-distance fall protection is the retractable web lanyard. A fall of less than six feet might not feel like a big deal; but trust us, it won’t be fun if you hit the ground! Although retractable web lanyards are designed for short falls, some versions, known as self-retracting lifelines (SRLs) are made to protect people from falls at greater heights. These devices consist of a lightweight cartridge that is securely attached to a body harness or belt, a spring-loaded coil, a durable web strap wrapped around the coil, and a hook or carabiner at the end of the strap. The SRL is securely attached to a person’s body, and he or she attaches the hook to an anchor. As the person walks away from the anchor, the web strap is drawn out of the cartridge, and it retracts back into the cartridge as the wearer nears the anchor. If the person should fall, the rotation of the coil activates the lifeline to bring the person to a halt before hitting the ground or other obstructions. They do not interfere with the tasks that are to be performed. They prevent people from falling or hitting the ground in the event of a fall. 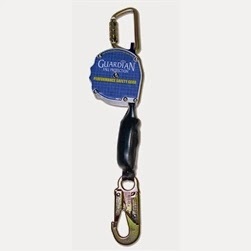 The retractable web lanyards and SRLs are affordably priced. When you look to HarnessLand for your safety equipment, you can rest easy knowing that our lanyards comply with all of the specified fall safety regulations as well as the needs of individual contractors. The SRLs offered by HarnessLand range from a 6-foot retractable lanyard for small jobs to a 50-foot web retractable lifeline with abrasion-resistant webbing. We’ve been named an authorized dealer by every brand we carry, and customer service is a top priority for us. So next time you need to scale a building or perform a dangerous task, unleash your inner Spiderman with a web retractable lanyard from HarnessLand! The safety and risk management procedures to protect construction workers are regulatory requirements, and project managers are usually well-versed in the specific federal or state OSHA mandates. The safety of the general public, on the other hand, is not regulated in the same way. There is no doubt that public safety is an important issue, and many OSHA regulations designed to protect employees also protect the public as an ancillary benefit, but the lack of clear regulations opens construction projects to varied interpretations of phrases such as “reasonable expectations,” “necessary precautions” and “customary measures” when accidents and litigations occur. If unrestricted, pedestrians and casual passers-by will almost always encroach upon a project’s boundaries. Unlike workers, they will not be wearing hard hats and steel-toed boots. And of course, the vast majority of bystanders have limited or no understanding of basic construction safety precautions. They don’t understand the radius of a crane’s boom or the momentum associated with a suspended girder or generator. They have no experience with falling objects and cannot be expected to know how far a dropped tool can travel on an unfortunate bounce. Project managers and foremen are not, however, left to devise safety measures on their own. The American National Standard Institute, together with the American Society of Safety Engineers, publishes a comprehensive consensus standard of safety guidelines that contractors and building owners can follow. This standard, titled “ANSI/ASSE A10.34-2001 (R2005), Protection of the Public on or Adjacent to Construction,” is designed to protect the general public from hazards associated with construction activities. Although project managers are not required to follow the guidelines in this standard, it is always wise to do so. ANSI/ASSE standards are widely recognized by industry, and they are often easier to understand than the regulatory language in OSHA documents. Voluntary adherence to ANSI/ASSE A10.34 demonstrates a concern for public safety, and it serves as evidence that the project utilized the industry’s best practices to manage risks associated with the construction. This is an important point to be able to make when “reasonable expectations,” “necessary precautions” and “customary measures” are discussed at a trial. The ANSI/ASSE standard for public safety during construction specifically addresses 14 safety hazards that are encountered during construction operations. Warning signs, lighting, netting, flaggers, barricades and the proper method for storing hazardous materials on a job site are all covered. These are issues that require specific safety devices, all of which can be obtained at online safety equipment sites like harnessland.com, but they are also issues that require careful thought and planning before any trenching ever takes place. Don’t take risks when it comes to public safety. We have all the construction safety equipment you’ll need to keep the public safe during an open construction project!